It’s the time of year for making resolutions and forming new habits. It’s my 4th new year focusing on reducing food-waste. Being mindful of what food is purchased, used and disposed of. The start of the new year is a perfect time to explain my simple Friday routine once more. And it’s the perfect time to remind myself of my ongoing quest to reduce waste, save money and serve up nutritious family meals. Thursday evening there’s a house meeting. Among other things, this is an ideal opportunity to identify what meals will be required the following week. Friday morning the fridge is cleaned. All items are removed and it’s sponge-cleaned with a mix of water and bicarbonate of soda. Anything fit for consumption goes back in the fridge. Items with a question mark on their edibility remain on the counter-top. A decision is made as to what can be safely eaten and what is food-waste. The aim is to reduce waste, as much as possible, by thinking outside the recipe and using imagination. The fridge is then restocked and a menu-plan for the forthcoming week devised. This is based on 6 days worth of meals (because I have yet to develop my skills enough to successfully plan 7-days – life gets in the way!). The weekly meal-plan is written on the kitchen chalkboard for all to see. Anyone asking ‘what’s for dinner?’ is directed there! If there is food that needs using up immediately then a No Waste Tastes Great meal is conjured up for Friday night. 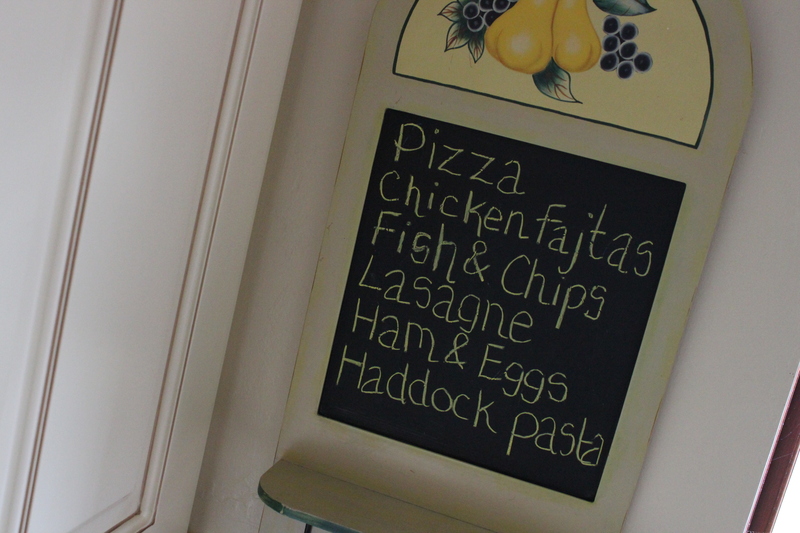 If the fridge is bare, it’s a trip to the chippy or takeaway for us. Mum gets a night off! Taking everything into account, a grocery list is pulled together. This gets mapped out – even at Christmas. Groceries are purchased the same day. The target is to spend just £50 on shopping – although this can increase some weeks. A further £10 is budgeted for Friday night. Keep an eye on the fridge throughout the week. Action may need to be taken before Friday to prevent food-waste. Jot down, throughout the week, items that may need replenishing. These include condiments, spreads etc. 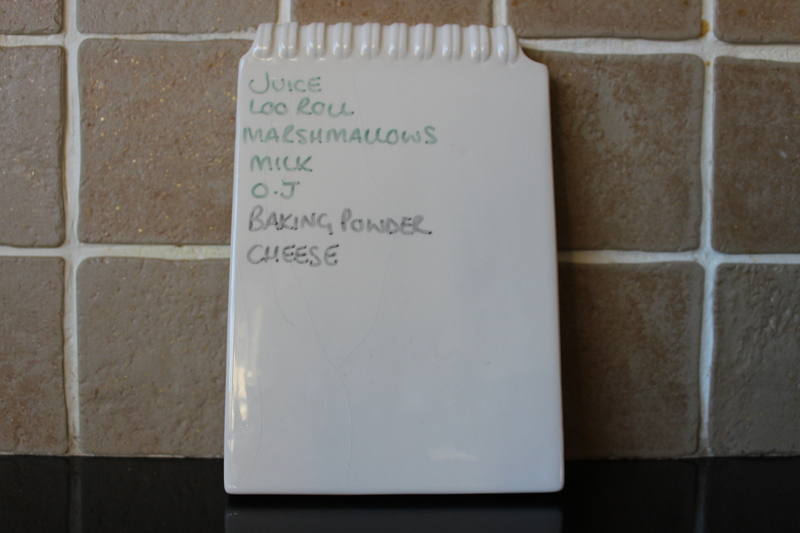 A ceramic notepad is a great reusable way to keep note. Make sure there are staple store cupboard and freezer items to hand. Even planning just 6 days doesn’t always go to plan. Emergency meals that can be made up quickly are life-savers. 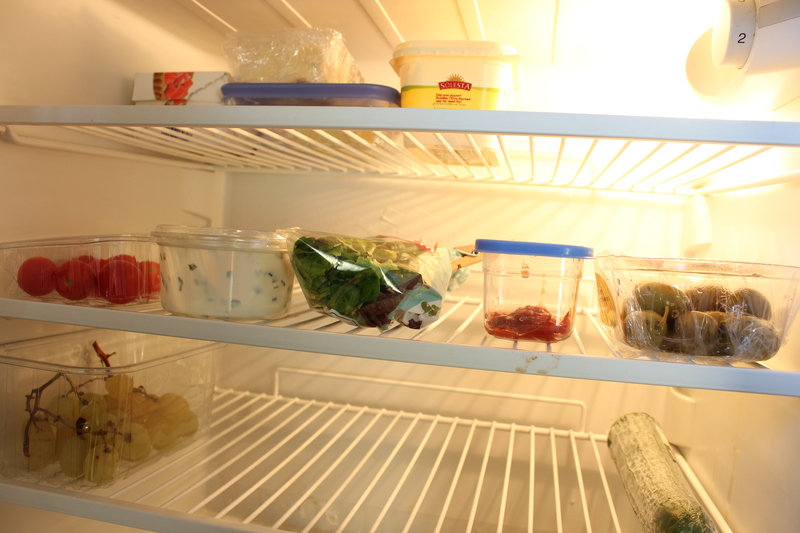 Keep in dried goods such as pasta and rice, as well as canned fish and frozen fruit and vegetables. Stock up an emptying fridge with water bottles to help keep the fridge running efficiently..
Every few weeks have a use-it-up week. Don’t shop, just make up meals from what is in the freezer and cupboards. This can be very interesting, and actually a great way of discovering new recipes. Be accountable. Blogging, each Friday, about my food waste has made a huge difference to the amount of food I now throw out. A huge difference. Commit to reducing food waste publically by blogging. 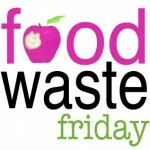 Or if you don’t blog – join in here and over at The Frugal Girl’s Food Waste Friday. How’s your Fridge looking this Friday? Anything to declare? Or is it nice and bare? Please share…and don’t forget to drop a link in the comments if you’ve blogged about it! No Waste Tastes Great is bought to you (as always) with thanks to The Frugal Girl for the original inspiration. I’m a cheese addict, and tend to eat way too much of it. And I like all different kinds, so my cheese drawer can fill so quickly that even I can’t keep up with it. So what I’ve been doing for some time now is grating most of the cheese (except the soft ones, of course) and freezing it in a large freezer bag. I do this with any and all cheese that can be grated, and the bag can contain up to eight different types of cheese at once, all mixed together. This cuts down on my spontaneous cheese-snacking, but is super in two other ways as well: It doesn’t go mouldy, and I always have an interesting mixture to incorporate into recipes. Because it’s grated, it thaws out quickly, but I don’t usually even bother to thaw it before throwing it into an omelette, biscuit dough, onto a slice of bread or toast for grilled or broiled sandwiches, etc., etc. It makes a killer macaroni cheese. Because the mixture varies all the time depending upon what cheese I’ve bought most recently, it also adds an element of intrigue: what will the mac & cheese taste like this time? The current mixture contains fontina, cheddar, smoked gruyere, parmesan, jalapeno havarti (the one cheese I grate sparingly into the bag, as it’s too spicy for some of my friends and family), and edam. To grate parmesan for the mixture, I always use my microplane, as it creates a lovely pile of fluff that does not overwhelm the other cheeses, which are grated on the box grater. Sorry for writing such a long reply, but I’m obviously quite enthused about this subject. Cheese is great, but it’s expensive, so I’m thrilled not to waste it. Proud of myself! We had a bit of a money health check last night – we filled in the spreadsheet budget planner on the money saving expert website. I recommend it highly. It’s free and a good way of re-focusing. We worked out our budget for food and weekly extras, and devised a menu plan for the week. I’ve just come back from shopping and have spent only half of the allotted budget – we’ll have to replenish fresh food in the week, but that won’t be much. Feeling really pleased with myself! Hope it will continue into next week. It’s nice to feel in control! Sounds great Helen – I will check it out! I love it when you post pictures of your blackboard menu plan 🙂 Always gives me ideas! Thanks Clare – it’s likely the board may become a semi-regular feature this year! Great post- inspiring and encouraging as always. Still working at getting my fridge as nice and bare as yours! Doing well but the holidays set me back bit. Leftovers are nice and all, but having all that extra stuff in there makes it hard to keep track and use it up. Loo roll- never heard that term before… love it! Had to stop and figure what it meant! Mine looks like a total hippie fridge: ferments, starters and other concoctions, all stored in glass jars. It’s fairly full but also small and the fermented foods last for months, so not too much goes to waste. I love how bare yours is though. I’m working on moving more toward glass!